Bostad's work focuses on evoking observation and memory through unknown and known meetings. There are echoes of people in her works, along with her perspectives as an observer. They represent the deconstruction of immaterial, a type of recycling that generates impulses as a new form. Artist is influenced by Gerard Richter, Francis Bacon, Edvard Munch & Hilma af Klint. Marit Geraldine Bostad (b. 76) is an abstract colorist. She works and lives in Horten, Vestfold County, Norway. The artist refers to her process as "intuitive, rich in color, and passionate...it has a nerve". Her paintings carry an emotionally-charged impetus. Describing her practice as a kind of therapy and a way for her mind to switch off, Bostad’s feelings about her work are highlighted by the lasting effect her paintings have on her audience. Her studio is located in a repurposed naval base.There she finds tranquillity and inspiration amongst the natural world and a rich history of the landscape. 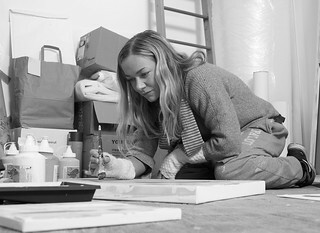 She has exhibited her work since 2011 in London, Oslo, and New York.